The Velvet Room Hair and Beauty is now also offering the flawless Individual Eyelash Extensions! We know how delicate the eye area is that is why we use a High Quality glue great for clients with sensitive eyes! Our glue contains no harsh ingredients that can cause any irritation! The Material of our Eyelashes is Silk, these are a mid-weight extension which is finer and more flexible, and they are very soft and tend to hold on slightly longer than some others. 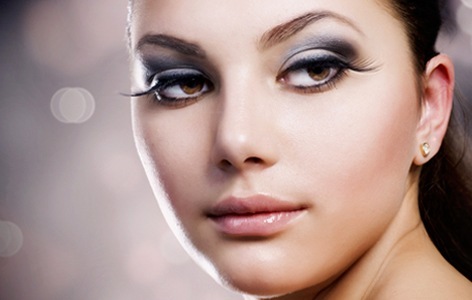 Depending on what you are after, silk lashes can be made to look very natural or very glamorous. Glamour sets of silk lashes are one of our most popular services as they are light weight, and are often a better option than other materials as they tend to last up to 6 weeks or longer depending on your home care. Silk is also not heavy on your natural lash, even if your own lashes are weak or fine. *please note as we cannot rush perfection our eyelash extensions take up to 2 hours for application. Infill’s are from$50.00 depending on amount required. Desiring a change in style that will leave you with the luscious long hair and enviable volume you have always dreamt of? Sick of waiting for an old hair style to grow out? Why not consider hair extensions? Hair extensions will immediately transform your look, not only adding length, but also thickness and texture. The Velvet Room ensures the superiority of your extensions by only using 100% Remy human hair of the highest quality. We understand that choice is important, so our staff have thorough training and experience in two types of hair extension products to ensure that your extensions achieve the result best suited to both your style and your budget. Utilising one of the most advanced technologies in hair extensions available in the market, Tape In Hair Extensions are the perfect way to achieve the full-bodied, length you desire, while causing no damage to your natural hair. Tape In’s are a permanent hair extension system designed to last for approximately 8-12 weeks after application. Perfect for those with a busy schedule, the entire process takes just 40-90 minutes. The process involves attaching strips of Tape In to either side of sections of your hair, varying colour and width of the Tape to ensure you attain the most natural and undetectable look. To guarantee that you get the most out of your extensions, the Tape In’s we use at The Velvet Room are reusable- lasting up to 12 months if cared for. To reuse your hair after to 8-12 weeks, we carefully remove and cleanse the hair, lift it into a higher position, and retape the extension so that you can continue to enjoy the celebrity hair look with minimal additional expense. One of the most respectable and renowned brands worldwide, Great Lengths offers virgin Remy hair that has never been bleached or damaged, and uses no toxins or chemicals to give you the highest quality extensions. Great Lengths uses a de-pigmentation process to remove the colour from the hair, to ensure that your extensions never fade or discolour. The hair is applied using Keratin Bonds, which allows the segments bind to your own hair more naturally than other processes. And as the hair is bought per piece, you have complete control over both the length and body of hair. The Keratin bond technique ensures your hair extensions achieve greater mobility whilst being securely attached, leaving you with the most natural result. The service takes up to three hours and last about 4 months in the hair, the cost starts from $12 per strand.